By Allan Fox: Amir Khan (32-4, 20 KOs) is rumored to be facing #10 WBA Samuel Vargas (29-3-2, 14 KOs) in his next fight this summer. Khan’s next fight is expected to be announced this Thursday by his promoter Eddie Hearn of Matchroom Boxing. This is a poor opponent for Khan if it turns out to be true. It makes Khan look like he’s padding his record in order to keep from getting beaten again. Fighting a low level fringe contender like Vargas is a move that seems to be bent on helping Khan look good in the eyes of the casual boxing fans, who don’t know the difference between quality fighters and poor ones. When Khan winds up destroying Vargas in two or three rounds, many fans will likely get excited and start believing that he’s turned his career around and is good enough to beat guys like Errol Spence Jr., Danny Garcia, Shawn Porter, Keith Thurman and Terence Crawford. The idea behind Khan fighting a no-hoper like Vargas is to make him look sensational to build momentum for a fight against Kell Brook in the fall. Brook has a nice mismatch coming up against a bottom fringe level fighter named Brandon Cook on July 28. This is such a mismatch that Brook isn’t even being given top billing on the card. His fight against Cook is the co-feature bout on the Dillian Whyte vs. Joseph Parker card at the O2 Arena in London, England. 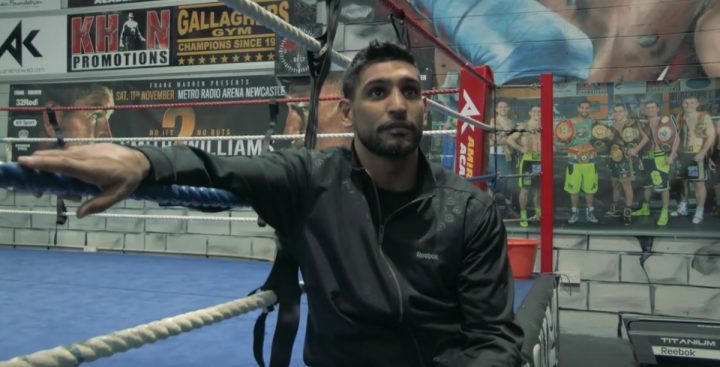 Khan is rated #7 WBA, #9 WBC, and he’s hoping to resurrect his career, but e direction he’s going in right now suggests that he’s still not interested in taking on anyone serious after being out of the ring for two years after his bad 6th round knockout loss to Saul Canelo Alvarez in 2016. Khan could build up his fight against Brook much better if he faced a good opponent, but that would be dangerous because it would entail that he face someone with punching power. Khan has shown little ability to take power shots in his career. « Is Pro Boxing dying for real?